Hip Hop is not only a genre of music but also a way of life as can be seen and felt in Play N Go’s online slot game Pimped. From the moment Pimped is loaded, you will get the sense of what is in store for you with the dollar bills raining down, the base of the music, and the high up view from the penthouse. The bling and matching soundtrack make you feel as if you are a VIP guest at a celebrity party. It’s time to take a walk on the luxurious, hip hop side with Pimped video slot. Let’s see what Pimped has to offer. 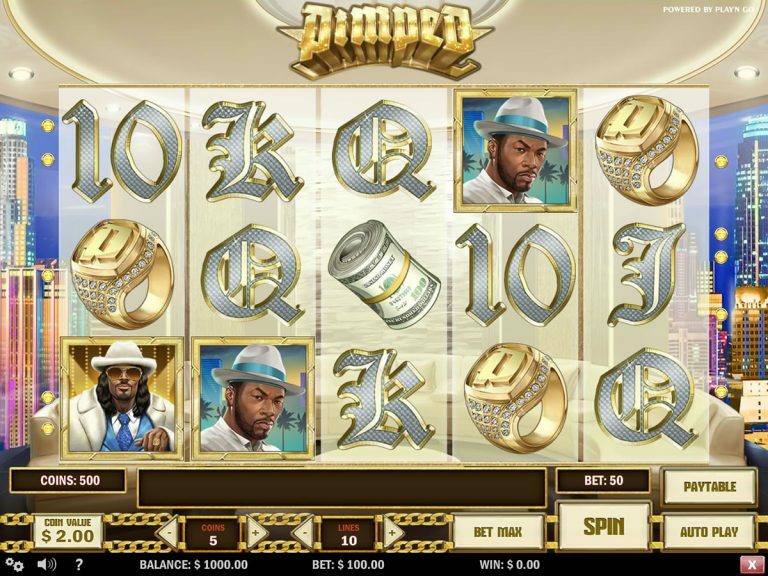 Pimped is a 5-reel, 3-row slot with 10 paylines. The action takes place in a penthouse that is overlooking the city skyline. The graphics are crisp, and the animation is smooth and adds to the atmosphere of the game without being distracting. Playing Pimped is simple; select the number of paylines and the number of coins per payline and hit the spin button. As the game loads, you are greeted with an intro video and some key info regarding wilds and scatters, but most notable, is the option to win up to 1,000,000 coins! Now, that is not something you see often on a non-progressive jackpot slot! The other notable special features of Pimped are the Wilds and Scatters. If you get 3 or more scatters, you win 5 Free Spins with a guaranteed win on every spin. Pimped also has a gamble bonus game, but we’ll get to that in a moment. With such a great looking, funky slot, it’s a pity Play’n Go didn’t throw in some more creativity when it came to special features. Pimped has 10 regular symbols, excluding the Wilds and Scatters. The high-value symbols of Pimped make you remember legendary hip hop artists like ‘Snoop Dogg’ and Xzibit. The ‘Snoop Dog’ icon has the highest value since he will generously give you 750 times your line bet if you land 5 of his symbols on a payline. The second highest is the ‘Xzibit’ looking man with a white fedora that pays 500 times your line bet and loves to show off his cash when you win. Third highest are the two ladies in bikinis who are worth 400x your bet for 5 of these symbols, and the two lowest symbols in the high-value range are the cash and pimp ring, which can give you 250x for 5 on a line. The low-value symbols are the typical A, K, Q, J and 10 but they are diamond encrusted to make you feel fancy when you land them, but don’t expect to win any major prizes with these. The wild is an image of a knuckleduster across a fist with the word ‘wild’ on it. This can substitute for any of the other symbols (except the dollar sign scatter) and appears to crack the screen when you land it on a payline. Getting 5 of these bad boys on a payline will pay a healthy 1000x your line bet amount. Finally, the scatter symbol, represented by a rotating gold dollar symbol, awards free spins. Pimped offers you the chance to play the gamble game after every win you get. A button will appear that says “Gamble”. If you select this, a screen appears with a card face down in the middle. This will give you a chance to double your win by guessing the color of the card, or if you want to quadruple your winnings, then guess the correct suit. However, you are limited to doubling up 5 times in a row or if you reach 2500 coins, but the experience is still fun and adds some excitement. If you don’t wish to play the gamble game, just hit the ‘collect’ or ‘spin’ button to continue. Besides the soundtrack, and the overall design of Pimped, the biggest attraction is the ‘Win Spins’ feature which is activated by three scatters. Landing them during a game of Pimped will award you 5 free spins with a guaranteed win on every spin, plus landing another scatter during the free spins rounds will give you another two free spins, up to a maximum of 20 free spins. You could increase your wins by 100X or more and win up to 1,000,000 coins. Pimped doesn’t offer a fixed jackpot nor is it linked to any progressive jackpot, however the lure of winning up 1,000,000 coins is more than enough motivation to play. Pimped is a 10 payline slot. Pimped offers a healthy RTP of 96,51%. Pimped has a high volatility, so you are going to have to spin the reels a fair amount to see some decent wins. Pimped Slot offers luxury, celebrities (at least their look-a-likes), cash, jewelry, and good-looking ladies to give you the hip-hop experience. Playing this slot is good fun, and the simplicity on one-hand is a benefit as you don’t need to think too much, but on the other hand, it would have been great to have a few more special features. Overall, Pimped is definitely worth taking for a spin.